"The retreat" corona's exclusive 24 hour guarded gate community. Spectacular views!!. Nestled on the edge of the cleveland national forest. This 5307 sq/ft, 5 bedrooms, 5 1/2 baths, has an amazing chef's dream kitchen with all thermador stainless steel appliance , 2 sinks, stained maple cabinets, granite counters, stone back splash, 48" built in refrigerator, pot filler, walk in pantry, spacious family room with fireplace, built-in entertainment center & surround sound speakers, formal dining room with french doors leading out to private courtyard, downstairs den/office, sweeping wrought iron staircase, convenient upstairs laundry, upgraded baseboards, crown molding, sconces, upstairs has bonus room , 4 bedrooms , 4 bathrooms, spectacular views from deck off master suite, retreat with dual sided fireplace, walk-in shower, dual vanities w/ granite counters & large garden tub. There is another view deck upstairs off front of home, private courtyard entrance, fire pit, covered patio, olive,orange & fig trees, 3 car garage. Close to shopping ,theater & restaurants. The community also has walking trails & private park. A 10+!! Stunning formal model home, almost never lived in! Located in the retreat, the inland empire's premiere 24hr, manned gated community. This home has a stunning view of the cleveland national forest. Must see in person to appreciate all the upgrades!! But here is a try at describing them: arched doorways and crown molding through out, gourmet kitchen island surrounded by french white cabinets that also extend to the dinning room, level-5 granite counter tops, built in sub-zero type refrigerator, top of the line stainless steel appliances, walk-in pantry, wood and travertine floors throughout with carpet in the bedrooms. Downstairs bedroom with private bath. Large family room and fireplace off kitchen. Formal living and dinning room. Master suite has a large balcony overlooking the mountain view. Three more upstairs bedrooms 1 with a private bath and 2 that share a jack&jill bath. Large bonus room has a wet bar and a private balcony. Front, back, and side yards have a lot of custom hardscape. 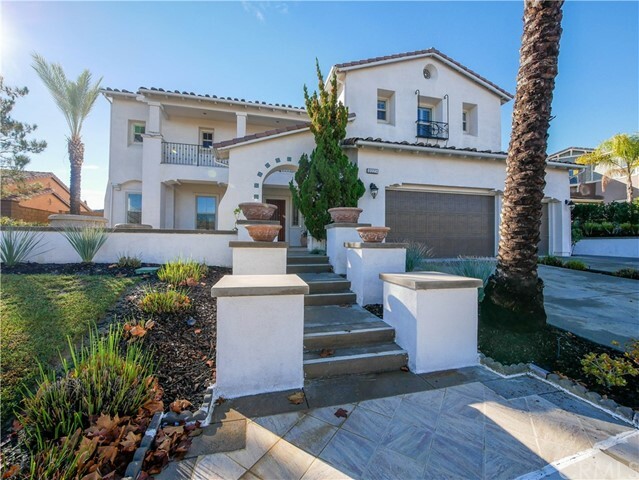 Live in style in corona's premier gated community, "the retreat". Approximately 4800 sq/ft, 5 bedrooms ( 1 down ) 4 1/2 baths, grand entry with 18 foot ceilings and wrought iron staircase, polished travertine floors, gourmet kitchen, stainless steel appliances, built in refrigerator, pot filler, 6 burner stove, pot filler, glass inserts on cabinet doors, walk-in pantry, granite counters, travertine backsplash, breakfast nook, built-in desk, under cabinet accent lights, spacious family room, surround sound speakers and entertainment niche upstairs has 4 bedrooms, 3 baths, jack n jill bedrooms, bonus room, sconces, crown molding, 7" baseboards, ceiling fans in all secondary bedrooms, huge master suite, coffered ceiling, view deck, all granite counters and tub surround, polished travertine shower, spa tub,vanity and his n her walk-in closets. Pool size yard, built-in bbq, outdoor fireplace, stucco patio cover, 3 car garage, epoxy floors , 10,890 sq/ft lot, built in 2005 and close to great shopping, theaters, restaurants, golf courses walking trails and freeways!! 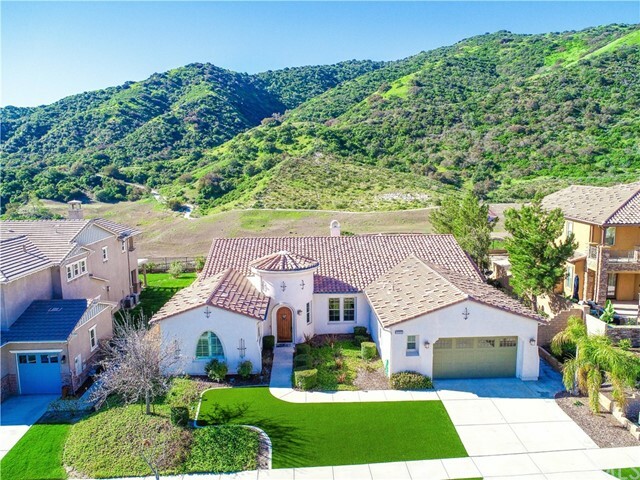 Highly sought after kb sienna ridge single story --- over 3,700sqft! Large +11,000sqft lot with panoramic views of the cleveland national forest and mountains. Dramatic 16 foot high turret entryway. 4 bedrooms and 4. 5 baths. All bedrooms are very spacious and have their own private, attached bathrooms. There is also an extra half bath for guests. Fireplace in the family room. Formal dinning room, large eat in kitchen with oversized island and breakfast nook. Custom cabinets, all granite counter tops and upgraded stainless steel appliances. Walk-in pantry, built in sub-zero type refrigerator, and a pot filler. Large master suite featuring master bath with soaking tub, his and her vanities, and large walk-in closet with built-ins. Laundry room with sink and lots of cabinets. Low maintenance front and rear yard with artificial turf. 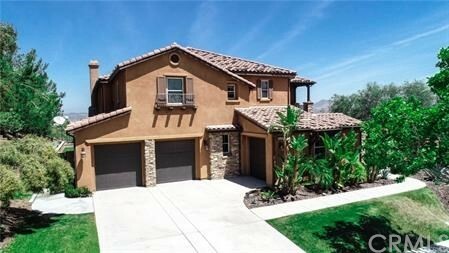 This is easily one of the best view homes in the retreat---the inland empire's premiere 24-hour manned gated community. Serene and stately 2,253 sq ft chaparral single story model at the 55+ active community of trilogy. This most popular model features a 3 car garage, butler pantry, open concept living space with gorgeous panoramic views of mountains and city lights gourmet kitchen and full counter stool seating, large interior laundry room with a window. Sumptuous master and bath, guest room, large office/library (3rd bedroom) with custom built in desk and shelving. Travertine like porcelain tile throughout the house. The home is located in the best 55+ retirement community in southern california! French doors lead out to the gated courtyard. This home is meticulously maintained. Beautifully designed rear yard for relaxing, privacy and entertaining!! The trilogy community offers an outdoor resort lifestyle and fun activities for everyone. Must see. Listing Agent: Twilla King Listing Office: Tarbell, Realtors, L.H. 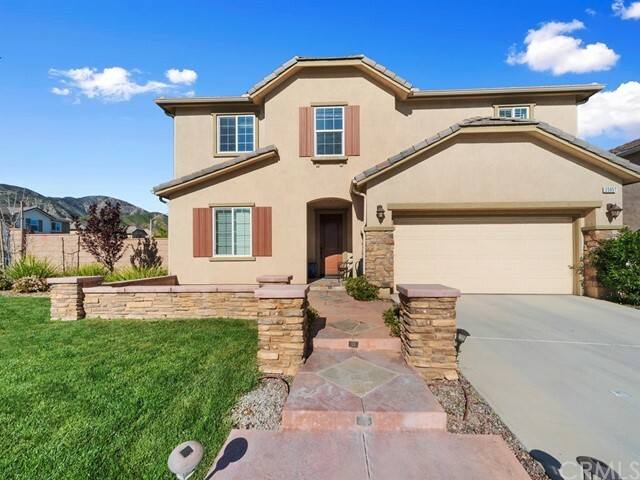 Spectacular two-story home in the highly desirable sycamore creek community! 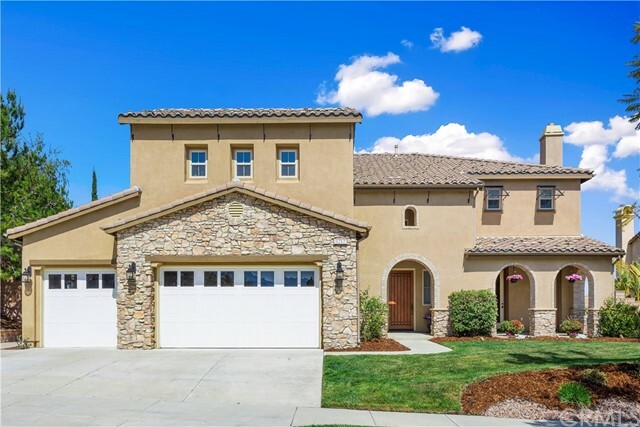 This home boasts 4 bedrooms and 4 bathrooms within a spacious 2,860 square feet of open living space. Upon entering the home, you are welcomed to upgraded flooring downstairs and sight-lines stretching to the backyard. The large living room is cozy with a fireplace and upgraded built-in shelving! The kitchen features a large center island with sink, with lots of storage and counter space, granite counter tops, and plenty of natural light that warms the entire home! Downstairs features one double-door bedroom and one full bathroom, perfect for guests or an office. The master bedroom is spacious and includes a standing shower stall, master bath suite with a tub, double sink vanity, and a separate toilet room. The backyard is perfect for entertaining as it features custom concrete, a covered patio, and complete barbecue pit with seating. The garage showcases epoxy floors and 3-car tandem parking. Family friendly neighborhood featuring over 125 acres of parks, swimming pools, and picnic areas, and clubhouse. 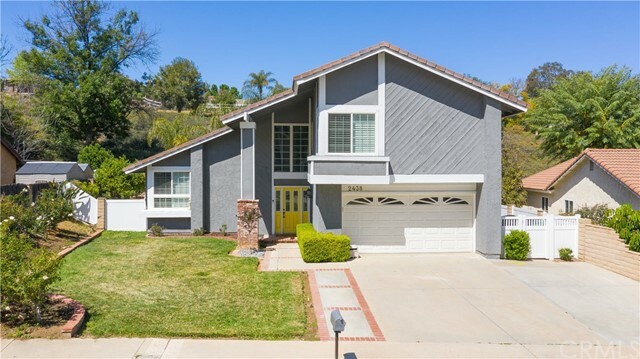 Located near the 15 freeway, and just minutes away from the highly-rated todd elementary in the highly revered corona-norco unified school district. You do not want to miss out on this opportunity! Buyers won't be disappointed! Turnkey! 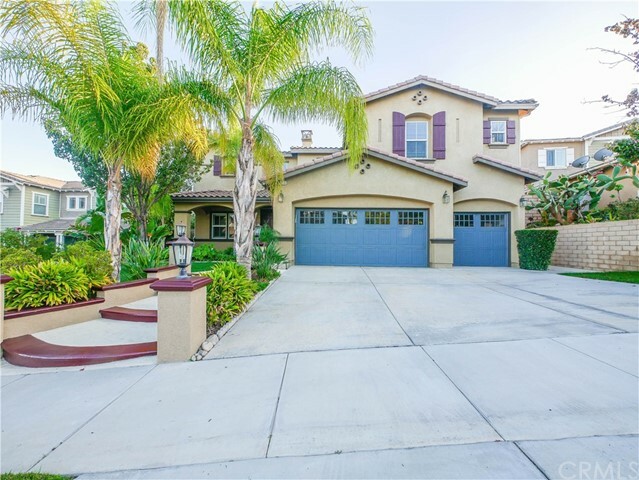 From the moment you pull up you will love this beautiful west corona home, located on a spacious tree lined street, in a spectacular and highly desirable neighborhood. Every detail of this custom home was carefully selected and quality crafted. As you walk up, notice the lush landscaping and gorgeous rose garden. You’ll enjoy the sunny, bright living room with floor to ceiling picture windows, cathedral ceilings and a full dining room. The remodeled kitchen features custom tile backsplash, beautiful upgraded cabinets, granite countertops, recessed lighting and stainless steel appliances. This well-appointed home also features high quality porcelain flooring, a uniquely, beautiful fireplace, and a lovely sliding door leading out to the spacious landscaped rear yard, featuring a patio cover stretching nearly the length of the home. The gorgeous, manicured back yard features a stunning rose garden and impressive palm trees. The dramatic stairway leads to the master suite, a private retreat featuring a beautifully upgraded bath. 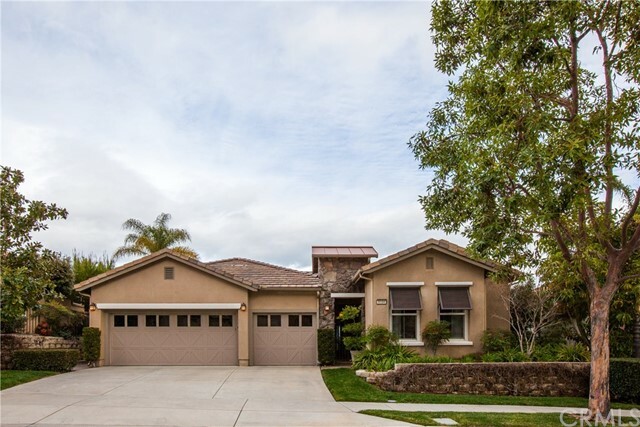 Home is easily accessible to the new foothill expressway and 91 freeway, minutes from orange county, hiking trails and parks. You’ll enjoy a stunning view of the cleveland national forest. Great private location backing to a large green belt that is part of the hoa along with a community pool and sports area. No neighbors behind!very low hoa and low taxes! Don't miss out on this uncommon opportunity!